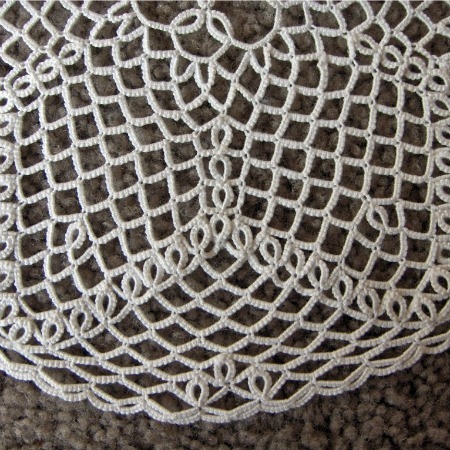 Congratulations, you’ve just finished your first tatted doily or edging and want to show off your accomplishment to your friends, family and anyone who will listen. Wait just a minute there, what are those wrinkles and dimples and twisty bits? Sorry to say, you’re not quite done yet. It still needs to be blocked. What is blocking, and why should I bother? Blocking is simply straightening everything out and adding a little stiffening so your project looks its absolute best for public display. When you show off your fancy tatting, you want it to look as good as possible, right? If not, skip this lesson. If so, read on. Blocking will take your project from the picture on the left, to the picture on the right. What needs to be blocked? Small projects rarely need to be fully blocked, but may need a bit of a tug here or there to get them into the right shape. Sometimes it is helpful to wet them in a bit of water and leave them under a towel and something heavy to dry. This will stiffen many small projects—e.g. a snowflake or single motif, etc.—enough to make them look good. Larger projects, at least in my experience, almost always need to be blocked. 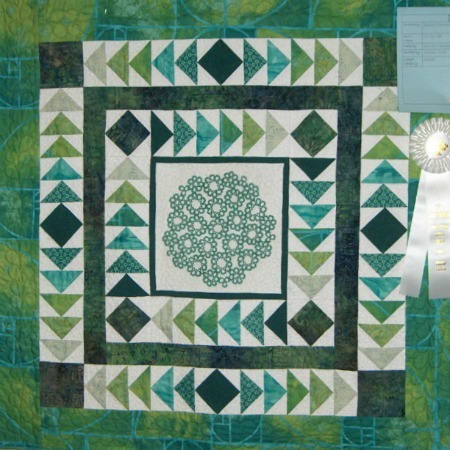 These are doilies and edgings and the like. Maybe some fabulous tatter can make them perfectly right off the shuttles, but I’m not that good yet. Mine usually end up with wrinkles or twisty bits. The first step is to hide all your thread ends in the stitches. Here is one method of hiding ends, and here’s another. Next, I recommend cleaning your project. Unless you’ve dropped your doily in the baby’s spit-up, this is optional, but if you intend this piece to last the test of time, then it is a good idea to remove your skin’s oils before sealing it in with starch. Simply agitate it lightly in a bowl of water with a mild detergent and lay out to dry on a towel. When all the ends and oils are gone, grab your ironing board. I like to block large projects on ironing boards, though I’ve heard of some people using their bed mattress. This might become problematic when you want to sleep. Lay it out neatly on the ironing board and start pinning from the center outward, at least one pin in every motif and wherever else it seems to need holding down or straightening. Joins, picots and long chains are common places to need pinning. Make sure to balance your pinning by working from one point to the opposite side, back to the first side and its opposite (like tightening lug nuts on a wheel) to prevent distorting the pattern. When it is all pinned, starch it—or use glue or sugar or whatever is your stiffening agent of choice—then leave to dry. Sharon of Sharon’s Tatted Lace has a very nice article on the merits of different stiffening agents. Leave the project to dry thoroughly, which means at least overnight. (Why I don’t use my mattress.) When removing the pins, again start from the center and work out, balancing the sides as you go. 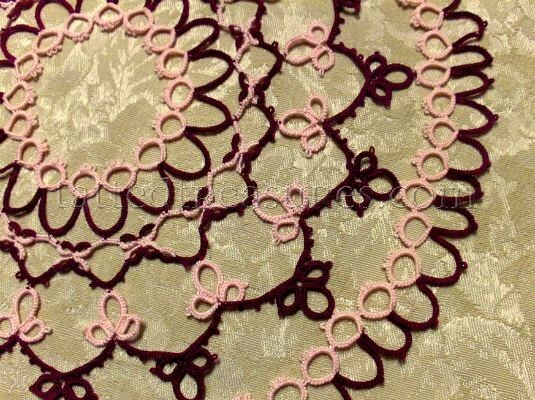 After reading many emails from readers, and following the InTatters tatting forum for months, the question I see most often about blocking is on the details of the pinning process. 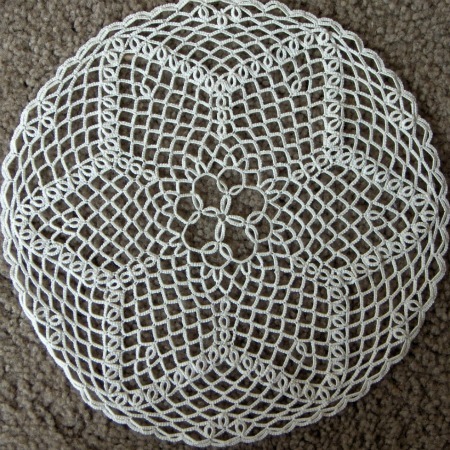 Therefore the video below focuses specifically on how to pin a large doily. I realize it is long, but pinning is a lengthy process. I decided too, that rather than edit out the repetitive parts that I would speed them up. This should still give you a good view of everything that is going on without drawing it out too much. If you don’t need so much detail, simply click fast forward. This post is part of a series of Absolute Beginner Tatting Lessons. Go back to the previous lesson, Sewing in the Ends, Method 2. I block on a large heavy piece of cardboard, using a template. You can generate a polar graph PDF and define the number of spokes (primary and secondary), number of concentric circles, line colours and page size. How do you prepare and mount tatting for pins? Do you need to put on a backing before attaching the pin? The thought of using my mattress for blocking made me giggle; I have a waterbed. 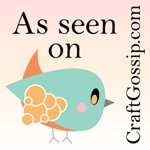 Love your site and your REALLY great tutorial videos! 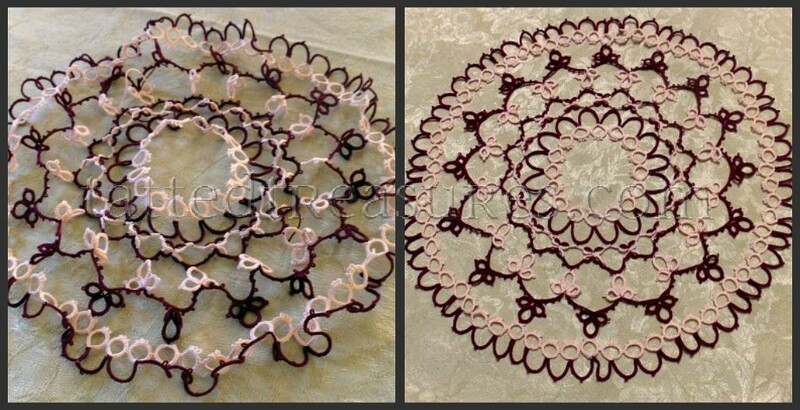 Tatting Tip: Which is the Right Side?